Video number three in my Summer Full Auto Fun Video Series! In this outside shooting test I take out my Cybergun KWC Desert Eagle .50AE CO2 Airsoft Pistol and shoot it in full auto mode again at some water filled pop cans and clay pigeons setup about 25 feet down range. Materials: Plastic main body with some metal parts. Weight: 1.6 pounds (708 grams). Barrel: 5.5 inches - Metal none rifled. 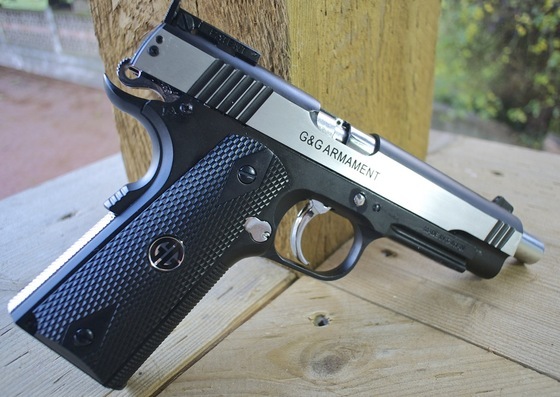 Action: Blowback single action only. Ammunition Capacity: 20 round top loading stick magazine. 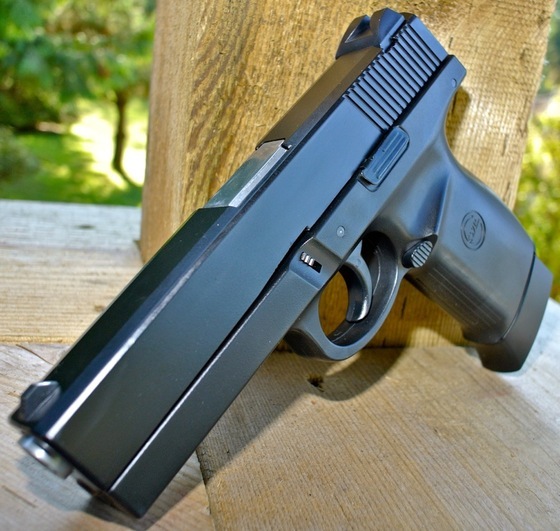 Trigger Pull: The trigger pull on the Daisy Powerline Model 400 CO2 Blowback BB Pistol is single action only and has about a medium pull to it, not the lightest single action trigger I have shot by far but not too heavy by any means. There is some initial take-up with a noticeable release point. Accuracy: Make sure to watch my full Field Test Shooting video for th PHOTO4 Daisy Powerline Model 400 CO2 Blowback BB Pistol. When performing my usual 30 foot out paper target shooting performance test I was able to get about a 2 inch 10 shot grouping using a semi rested stance. This pistol did shoot rather on the high side so you will have to aim low as the sights are non-adjustable. In terms of velocity I was able to get fairly consistent 350fps performance using a brand new CO2, this is pretty good considering this is a 20 year old pistol and may have been one of the first blowback airguns to hit the market. The Daisy Powerline Model 400 CO2 Blowback BB Pistol was a bit of a CO2 hog only getting around 50 shots out of one 12 gram CO2. 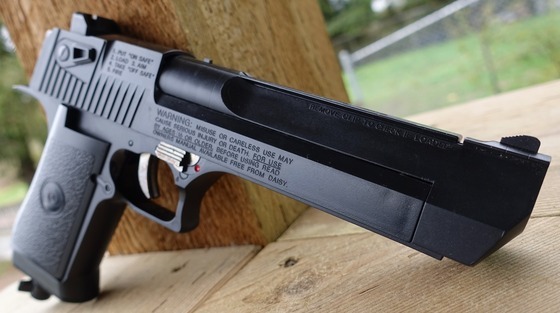 Build Quality: The Daisy Powerline Model 400 CO2 Blowback BB Pistol is a mainly all metal airgun but it is solid and well built, The plastics used long ago in my opinion are superior in terms of longevity to today plastics. 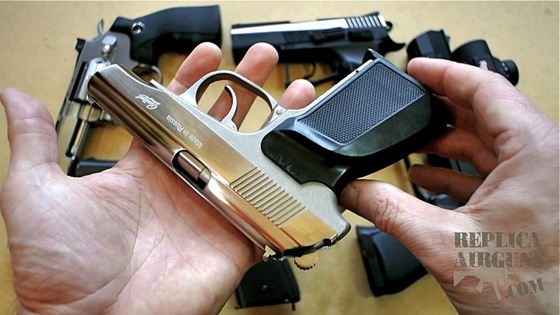 Being a Japan built gun is also a plus and you will find metal parts where they need to be as in the hammer, trigger, barrel, safety and many other internal parts. Keep my used pistol is over 20 years old and still looks and works like new. Realism: The Daisy Powerline Model 400 CO2 Blowback BB Pistol is an obvious replica of a Desert Eagle Semi Auto Pistol, there are no licensed markings but there is no doubt what this gun is intended to look like. In terms of size and overall appearance it is a good copy of a real steel Desert Eagle but it does weigh in a lot lighter being made mostly from plastics. Some mechanical parts are moulded into the gun like the safety and slide catch but the blowback operation helps add back to the realism. 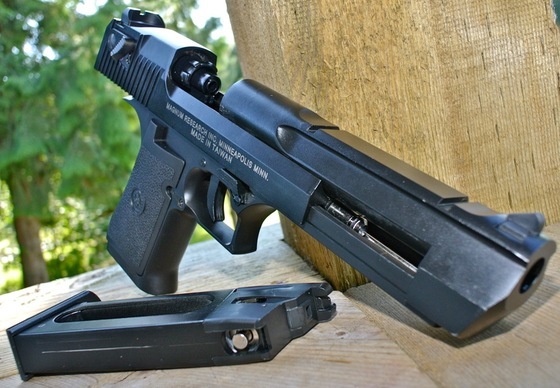 Of course the top loading 20 round BB magazine is not at all what you would expect to find on the real Desert Eagle, that said it is practical for loading a BB gun. Pretty decent Desert Eagle replica. True single action Blowback operation. Metal parts where they need to be (Barrel, safety, hammer, trigger and other internal parts). Top loading 20 round stick mag is removable. Shot a bit high but proved to be fairly accurate. Got decent fps for super early generation blowback pistol. Very unique and hard to find airgun to add to ones collection. None adjustable sights, shot kind of high. Did not get a lot of shots per CO2, maybe 50-60 or so. I like my Blowback airguns and I also like guns that are a bit unusual or you don't see very often. The Daisy Powerline Model 400 CO2 Blowback BB Pistol hits both of these point in my books and also turned out to be a fun gun to shoot! 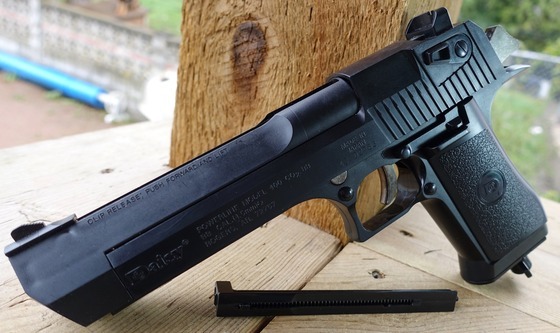 Good luck finding one in good condition but there are other options out there if you are wanting to pickup a Desert Eagle Replica Airgun, take a look at the Umarex CO2 .177 Caliber Pellet Shooting Blowback Desert Eagle or the KWC Full Blowback CO2 Airsoft Desert Eagle. In this 6th Mike's Personal Guns For Sale video, I am offering three of my Airsoft pistols, the super popular Dan Wesson 6 Inch Silver in pretty much brand new condition complete with the box, manual, speed loader and shells. I also have tow rather hard to get Airsoft guns that are in somewhat limited working condition and need a little TLC. But the simple fact that they are not easily obtained here in Canada does bring up their value a little bit. Make sure to watch my above YouTube video to see these Airsoft Pistols I am selling and instructions on how you can take part in the sale and purchase of them. By the way I am only selling to Canadian residents since shipping cross borders is a little sketchy. This Update video addresses the similarities between the KWC and Cybergun product lines, specifically the KWC Model 1911 vs. the Cybergun Tanfoglio Witness 1911 and the KWC Taurus PT99 vs. the Cybergun GSG 92. In a nutshell, they are all made by KWC and are exactly the same with the exception of some of the licensing and branding that goes on the slides. Cybergun simply contracts KWC to make the guns for them and add some slight different printing. All parts are interchangeable. Lastly, I show for the first time a G&G Airsoft product, the G&G Xtreme 45 Blowback that looks an awful lot like the Umarex Colt Special Combat chambered in 4.5mm Steel BB. 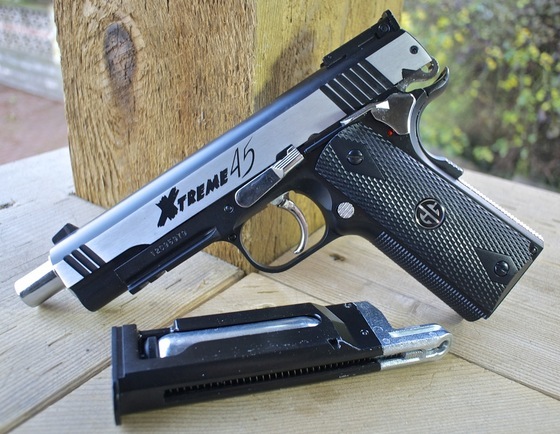 The main differences are that the Colt Special Combat is a BB gun and the Xtreme 45 is an Airsoft gun. 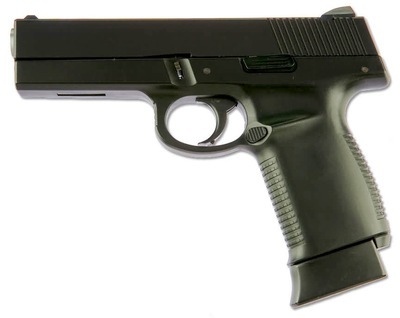 The G&G has blowback where as the Colt Special Combat does not have blowback. Make sure to checkout my YouTube video of this product update for even more info! I recently picked up a couple of really nice condition pre-owned Air pistols, both replicas of some IWI (Israel Weapon Industries) semi auto pistols. The biggest and baddest being a very authentic replica of the notorious Desert Eagle. 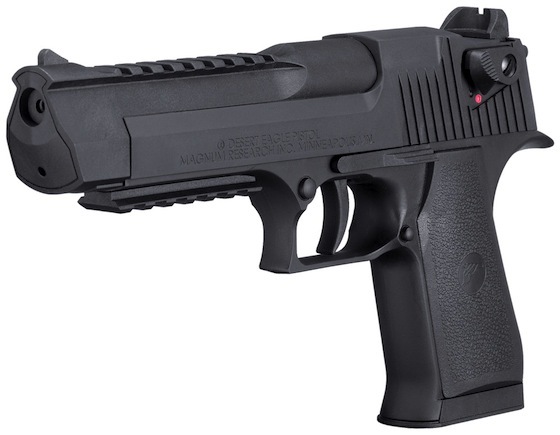 This Umarex CO2 Airgun Desert Eagle shoots .177 caliber pellets using an 8 shot rotary magazine and has realistic blowback action with over 400 fps velocity. It has excellent accuracy and packs a real punch. 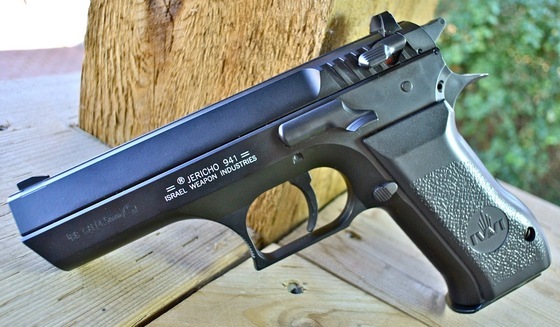 I also have my Cybergun Jericho 941 which again is a very believable replica of the real steel semi auto pistol, some people refer to it as the Baby Eagle. The 4.5mm BB version has a full metal slide and full size drop out metal magazine that holds the BB's and CO2. Both guns are in like-new condition and come with the original boxes and manuals, the Desert Eagle even comes with three magazines. To get in on the bidding, simply Email Me Here with your highest bid by no later than October 10th 2012 at midnight. At the conclusion of this Silent Auction I will notify the winner. This Airgun Silent Auction is open to both my Canada and US customers, Canadian Customers will pay an additional $17.99 for Shipping/Handling plus their local provincial sales Tax. US Customers will pay $29.99 International Canada to US Shipping & Handling but will not pay any sales tax. Good luck to everyone! 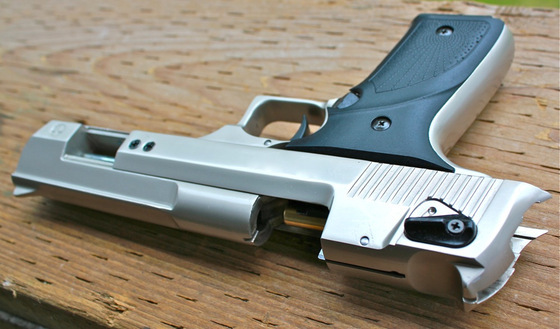 Model:Desert Eagle .50 & Sigma SW40F. Materials: Metal slide & polymer frame. 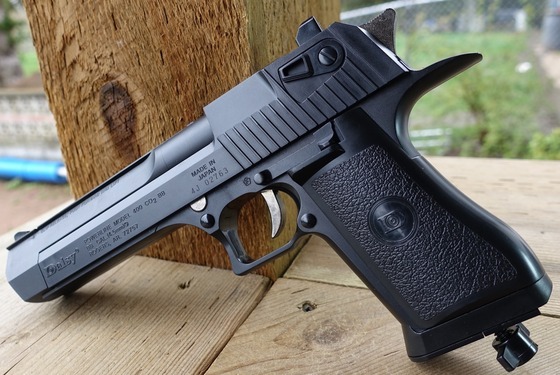 Trigger Pull: The trigger pull for both KWC blowback single action pistols is very good, the Desert Eagle is a bit better with less play and a lighter pull while the Sigma SW40F still feels very good but has a little bit more take up and a slight bit more pull required. Accuracy: I shot both guns from 20 feet out in semi rested position and got similar results. I was able to place 10 rounds in a 2.5 to 3 inch group and both guns shot well centered. I have full confidence that I could easily hit a man sized target from 50 feet away. Both KWC Airsoft pistols got right around 400 fps (5 shot average chrony testing) with the Desert Eagle only 10 fps higher than the Sigma SW40F and this was using .20 gram plastic Airsoft BB's. 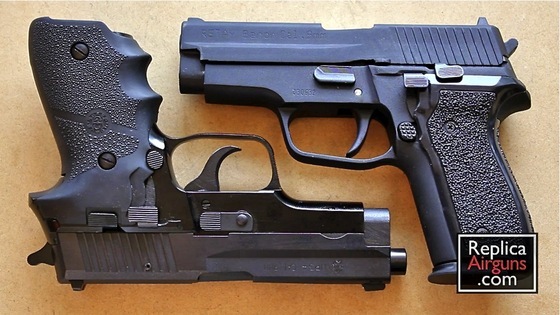 Build Quality: The build quality for both guns is pretty much the same, both have a metal slide and barrel with a polymer frame and plastic grips, the Sigma SW40F had a plastic magazine release and trigger while the Desert Eagle used metal in these parts. The KWC Sigma SW40F seemed to wear a bit better as the painted finish seemed more durable. I found the metal on metal areas on the Desert Eagle where losing the paint and also in some of the high spots. Over all the guns worked very well and had good fit and finish. Realism: The KWC Desert Eagle .50 and Sigma SW40F are very accurate replicas of their real steel counterparts, with the Desert Eagle also having the full licensing on it for added authenticity. The workings of both Airsoft guns are pretty much just like a real gun with full size drop out magazines and very heavy full blowback operation. The slides on each gun give a nice metallic sound when operating. Lots of metal and good overall weight. Good accuracy with both guns. Very believable replicas of the real steel versions. Paint wear in high spots noticeable on the Desert Eagle. Both go through CO2 fast. No trademarks on the Sigma SW40F. Two very nice KWC Blowback Airsoft Pistols where add to the Canada Replica Airguns store and yes one is the large and in charge Desert Eagle! One question I get asked often is "Which are my favorite airguns?" or "What are my top 5 gun choices?" I have done my best to avoid answering this question because it's a very hard question to answer and to be truthful on any given day I may come up with a different selection of guns as there are just so many great airguns out there! So today I took a bunch out and shuffled through them all to see if I could come up with five of my top picks, well at least for today that is, and I'm pretty happy with my selection (Umarex Desert Eagle - ASG CZ 75 P-07 Duty - Baikal MP-654K Makarov - Cybergun Tanfoglio Witness 1911 - ASG Dan Wesson 6 Inch Sliver). I know for a fact they are some excellent choices and if you happen to own or plan on buying one then I'm sure you will agree wiht me. So checkout this YouTube Video Review where I go through them and explain what I like about each gun, and why they made my Top 5 Airgun Pick. Ammunition Capacity: 18+1 round magazine. Trigger Pull: The trigger pull on the Retay is about medium pull, it is a bit heavier in double action mode as would be expected and I found that the release is fairly near the very end of the pull. I'm pretty sure the real Desert Eagle only has single action operation but being able to shoot in both actions is kind of nice. Build Quality: The build quality is similar to that of my EKOL blank guns which makes sense since they are both Turkish made guns. The Retay Eagle is well built and uses good quality materials, this gun is almost all metal and has good heft to it weighing in at 3.1 pounds. The finish quality is typical of other Turkish guns - good but not perfect. The satin finish on this gun has a raw metal look but with a slight gold tint and a semi polished look, keep in mind we will be selling it in Matte Black, non-shiny Chrome and Nickel. The Retay Eagle performed very well for me and had no problems with loading, firing and ejecting rounds when I tested it. Realism: The Retay Eagle Desert Eagle copy is a pretty decent Desert Eagle replica with a few small exceptions. 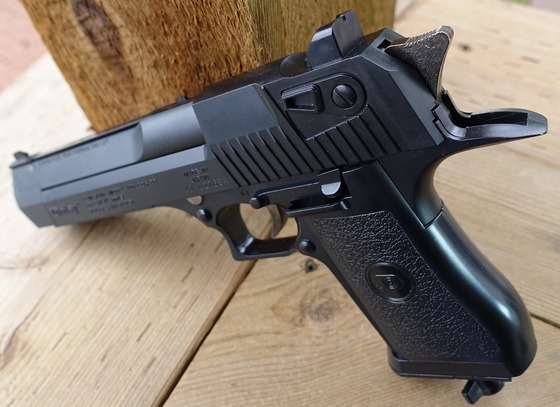 Overall I would say it is slightly smaller than a real Desert Eagle and has a bit smaller handle which may be good for people with smaller hands and it also has 2 screws near the front of the slide on each side that would not be there on a real Desert Eagle. Good hefty 3.1 pound weight. 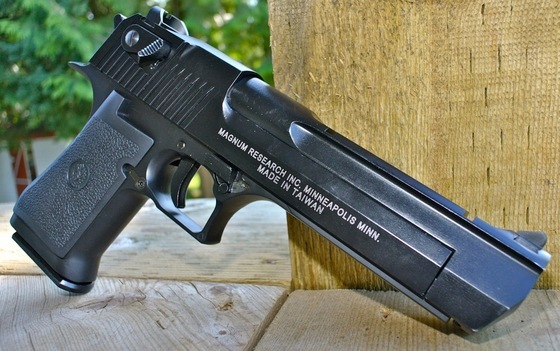 Good replica of the Desert Eagle semi auto pistol. Trigger is both single and double action. 18 round magazine is very high capacity for a pistol. Performed very well in my tests with no chambering, firing or ejection problems. It's a Desert Eagle for goodness sake - isn't that enough! 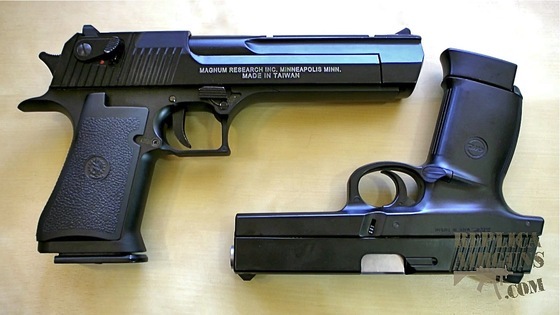 Slightly smaller in size then a real Desert Eagle? The screws on the slide are a bit out of place and would look better color matched. No Manual or cleaning rod included. 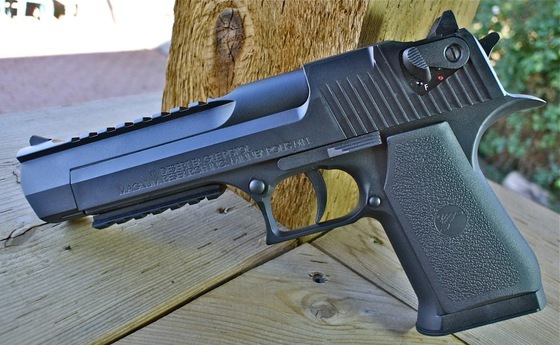 This gun was a must have blank gun for me, owning a real Desert Eagle is pretty much out of the question because they are not cheap to buy and operate. 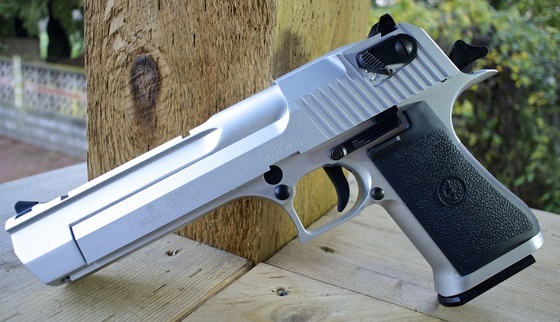 For a very small fraction of the price of a real Desert Eagle I get to own the next best thing and as a matter of fact, I may just buy one in each color since the price is very affordable! As with many of the blank guns, the Retay Eagle would make an excellent prop gun for TV or Movie scenes. And you can always impress you friends by pulling out the Retay Eagle and proclaiming "That's not a gun - This is a gun!" I will be doing full reviews of these three Retay guns; the CS9 (Smith & Wesson CS9 Copy), Baron HK (Sig Sauer P228 Copy), and the Eagle (Desert Eagle Copy). For know I wanted to at least give you a quick preview video of them. My full review videos will focus on each Retay blank gun individually and go into detail with shooting tests and Fields Strips when possible. My basic first impressions of this new blank gun offering from Retay is that they are a welcome addition to our current blank gun offerings here in Canada and what I like most is that all three guns are very different in look and design then the EKOL guns we have had for some time now. As far as quality goes, I would say they are on par with the EKOL guns and being that they are made in Turkey this shouldn't be too unexpected. 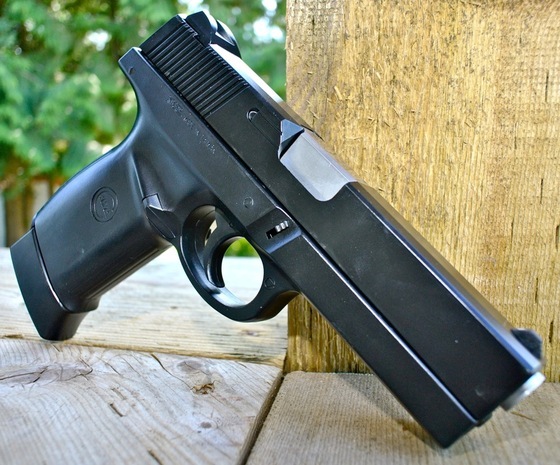 Keep checking back as I will be reviewing all three Retay 9mm P.A.K. blank guns over the next little while. Last but not least and certainly not the smallest! 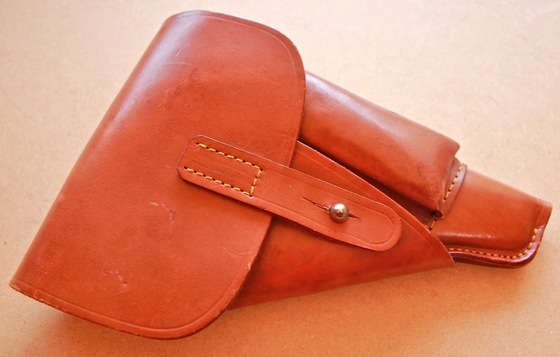 I just added the Retay Desert to the Replica Airguns Store. And I am sure most of you can figure out what this 9mm P.A.K. 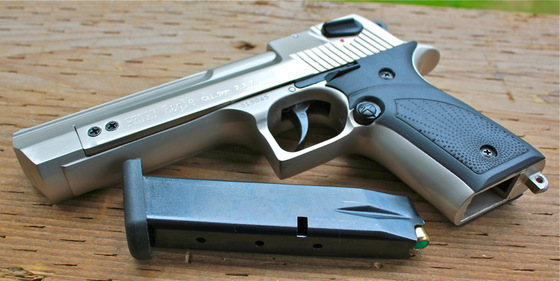 blank shooter is a replica of... the infamous Desert Eagle! I wanted to make this one just a bit more special by also offering it in a shiny Nickel finish. It also comes in Matte Black and Chrome but keep in mind that Turkish Chrome is not a shiny Chrome, it's more like a soft metal look.The Retay Desert is being pre-sold at a special pre-sale savings of $44 off on this one, shipping right around October 20th. 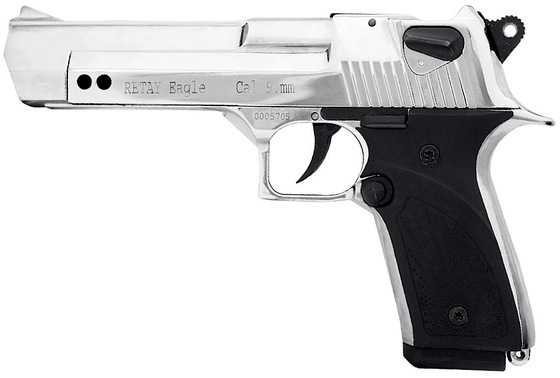 The Retay Eagle is a very nice copy of the IMI Desert Eagle full size semi auto pistol. It is a mostly all metal 9mm P.A.K. blank shooter that is front firing and comes in a hard shell case with a flare adaptor. 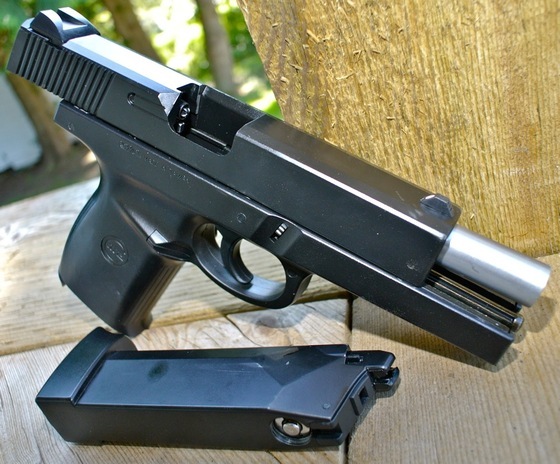 This blanks shooter can be shot in both single and double action and is a real handful! Yet another Chronograph video! I'm working my way through my air guns and starting with the ones that I have been asked about the most, and that I'm also the most interested in finding out what the true "real word" feet per second ratings are. Todays Chrony Chronograph test was done on my Umarex Magnum Research Desert Eagle Blowback CO2 .177 caliber pellet pistol. The factory rating was stated as being a respectable 425 fps which is pretty good for a blowback pellet shooter. The Umarex Desert Eagle is a crisp and accurate shooter that likes to eat up CO2 cartridges, so the factory claims are believable! I am happy to say that on a fresh CO2 cartridge, in not too warm spring Vancouver weather, I not only hit the 425 claimed fps, but exceeded it with a few shots. 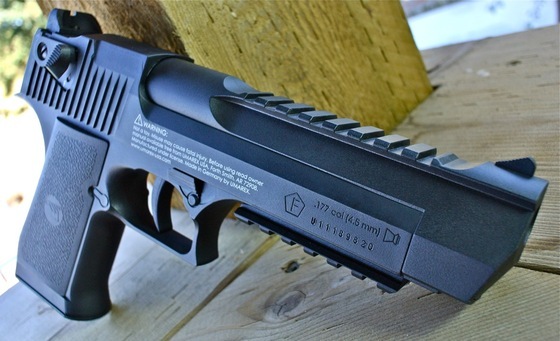 If you have watched my Umarex Desert Eagle Review Video, you probably heard me whining about not having an under barrel Tactical Rial for my Umarex Desert Eagle. Well the whining paid off because with some help from Justin from California USA, I was able to get a replacement Tactical Rail! I guess Justin didn't need his and he offered to sell me his at a very reasonable price and I am now so happy my Umarex Desert Eagle has been reunited with its accessory Tactical rail. 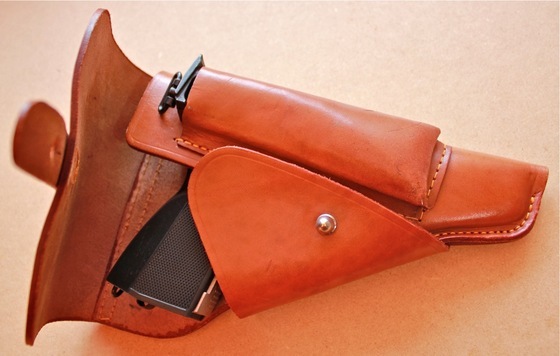 I also received another treat today in the mail - a beautiful tanned leather holster for my Nickel Baikal Makarov graciously given to me by Mark from Ontario Canada. Mark has a wonderfull collection of Air guns past and present and had an extra Makarov holster he though I would appreciate - and I certainly do! Thanks so much Justin and Mark! Materials: Exterior mostly polymer with internal metal parts. Action: Semi auto, blowback, double and single action. Ammunition Type: .177 cal. Pellets. Ammunition Capacity: 8 rounds - rotary magazine. Trigger Pull: The trigger uses two stages. The first stage rotates the magazine while the last stage releases the hammer. When in double action mode the trigger also engages the hammer. Overall the trigger pull I would consider to be a medium pull yet smooth making it easy to shoot on target. Accuracy: Very good, the Umarex Desert Eagle makes a great semi-auto target shooter as far as 30 to 40 feet out. 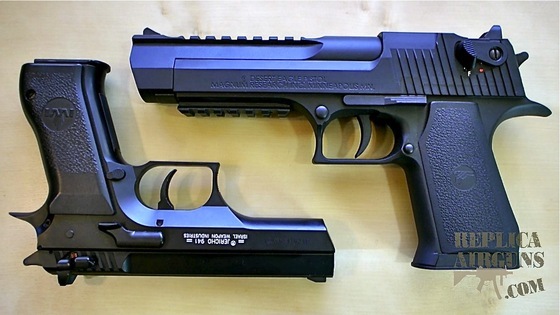 Build Quality: Even though the external shell of the Desert Eagle is mostly plastic, it is still a very well made gun. Most of the internal parts that matter seem to be made out of metal. The fit and finish is also very good. Realism: This is a very close replica to the real actual Magnum Research Desert Eagle with licensed trademarks and most everything in all the right places. However, other than the safety lever, many of the mechanical aspects of the gun are either non-functioning or serve an alternative purpose. 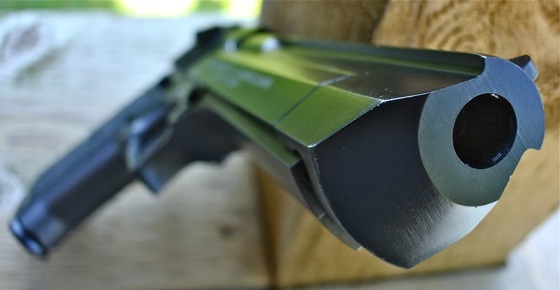 The slide release actually opens the loading bay by making the barrel slide forward. The disassembly lever is non-functioning and is molded into the plastic along with the magazine release button. Purchased this form: The Replica Airguns Store. Good reproduction of the original Magnum Research Desert Eagle. 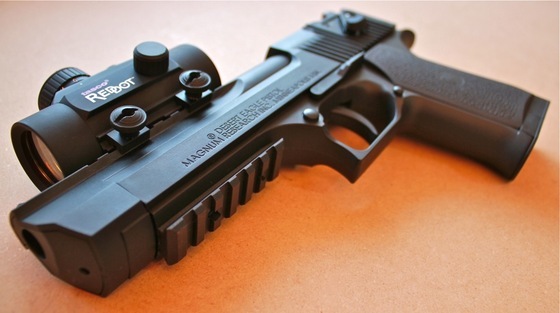 Blowback action and loud report add to the realism of shooting this pellet pistol. Nice high FPS for a blowback pellet gun. Picatinny rail on top and bottom for accessories like a scope, red dot, laser sight and/or tactical light. Slide does not stay back after 8th shot so you need to count them off or you end up wasting CO2 before you realize no pellets are coming out. No way to keep the slide back, no working slide release. Lots of usage of plastic, would have been nice to have seen more metal in it. Large gun, not suitable for people with small hands. 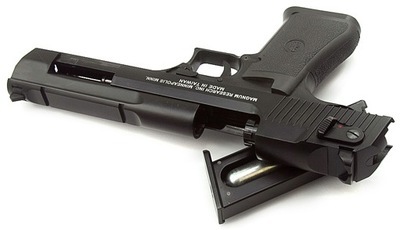 The Umarex Desert Eagle is a very unique pellet blowback air pistol, there are very few airgun pistols that include blowback, shoot pellets and have decent accuracy and FPS . 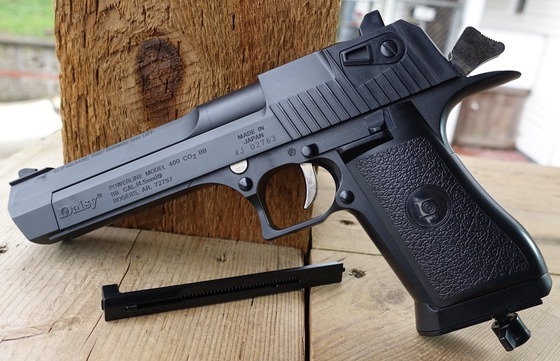 The Umarex Desert Eagle is a very close replica of the original Magnum Research Desert Eagle. It has very good accuracy but you can only expect about 32 good shots (4 magazines) out of a CO2 cartridge. 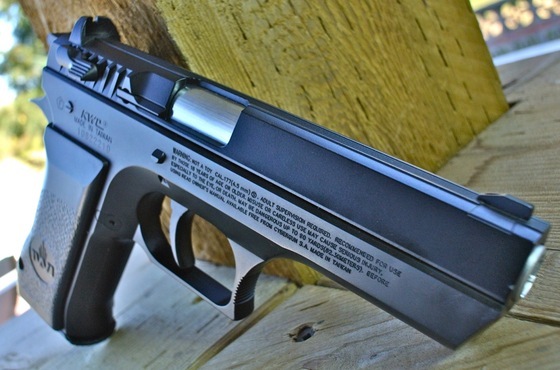 If you're looking for an airgun that may be a bit of a handful and can get over the abundance of plastic and hunger for CO2, than you will be rewarded with a predictable, accurate and enjoyable true semi-auto target pistol.